I strive to give patients the best dental experience. I want people to understand that seeing the dentist is nothing to worry about: leading-edge techniques and advanced technology mean truly comfortable care. If I can remove a person’s fears, they’re more open to learning about their oral health and how to care for their smile. That, in turn, means happier, healthier people who will enjoy a lifetime of incredible smiles. Dr. Bryan and Dr. Dedi met while enrolled at Indiana University. After graduating in 1993 with a bachelor’s degree in biology, Bryan married Dedi and they moved to Indianapolis. There, the couple expanded their family with the birth of twin daughters and, several years later, a son. Bryan loved being a father and decided to stay home with his daughters. This enabled him to support Dedi while she finished dental school at Indiana University and launched her first practice. When the time was right for the family, Bryan went back to school. He completed a master’s in biology at Purdue University and then earned his Doctorate of Dental Surgery from the Indiana University School of Dentistry. Dr. Bryan is passionate about remaining current on changes in dentistry. He understands his patients trust him to deliver the right care for their situation; by pursuing continuing dental education, he’s able to provide the best treatment experience and strongest results. 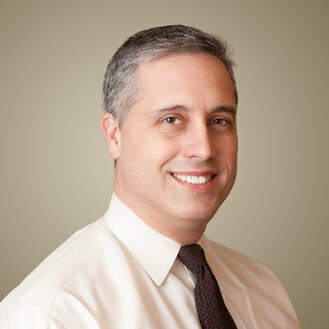 Among the many topics Dr. Bryan has studied extensively are: dental implants, Invisalign®, IV and other forms of sedation, same-day tooth replacement, and 3D digital impressions. When he’s not at the practice, Dr. Bryan is usually with Dr. Dedi and their family. Their daughters, Lauren and Rachel, are now out of high school. Gavin is still in school. He plays baseball and the trumpet. The family also has three dogs and a cat. Dr. Bryan keeps busy trying to catch up on all the “Honey Do” lists that accumulate while he’s caring for patients. His favorite way to relax is to spend time on the water with his family and a few good friends. He particularly enjoys jet skiing and fishing from the dock. Dr. Bryan is also active within his church, to help others whenever he can.